I was out of town last week for 5 days traveling for work, which usually means I don’t eat so well. It’s tough when you’re traveling with a group or in a new place to find something healthy, so I suppose it was inevitable that BBQ, grilled cheese, spaghetti, and more made an appearance. Seems like any time I get home from a work trip, I’m filled with this urge to eat salads. Which is exactly how this Rice Noodle Shrimp Salad came to be. I was inspired by a recipe that the Honest Company shared on their blog a while back, and couldn’t wait to put my spin on it. I wanted this recipe to be gluten free and dairy free to really keep it light and healthy. And I also didn’t want anything too heavy, so a delicious vinaigrette was a must. It’s been a while since I’ve made a pasta salad, which let’s face it, is my favorite kind of salad. Being the pasta fanatic that I am, I’m happy to figure out ways to work it into my weekly meals. And I love rice noodles and the texture they provide, plus they hold up really well in dishes like this. Now I won’t lie, there’s a fair amount of prep work that goes into this Rice Noodle Shrimp Salad. So if you’re prepared to chop up some fruit and veggies, then I urge you to dive in to this recipe. I started it all off by soaking my rice noodles in cold water for about 30 minutes. Then I made the shrimp marinade that was a tamari and lime based marinade with a little honey and some fresh ginger and garlic. Let the shrimp marinate at least 15 minutes, and then whip up the dressing. The dressing is really similar to the marinade but it has the addition of sesame oil, and I didn’t add red pepper flakes like I did to the marinade. And then chop up the cabbage, red pepper, kale, and papaya. I cut corners by using pre washed and cut dinosaur (lacinto) kale and also thawed some frozen pineapples for a little sweetness. 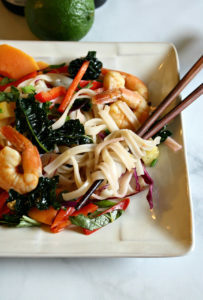 The papaya and pineapple also added to the textures with this Rice Noodle Shrimp Salad, and papaya is so good for you. I found a gorgeous one at Trader Joe’s, and it’s great for your skin, so I foresee leftover papaya making an appearance in smoothies and some DIY beauty stuff. I really can’t say enough about how delicious this recipe is! The noodles and shrimp both cook in 2-5 minutes, and they both add a nice chewy texture. Plus it’s always fun to twirl the noodles when eating. And I love the crunch you get from the red pepper and cabbage. And the kale keeps it all grounded and earthy. 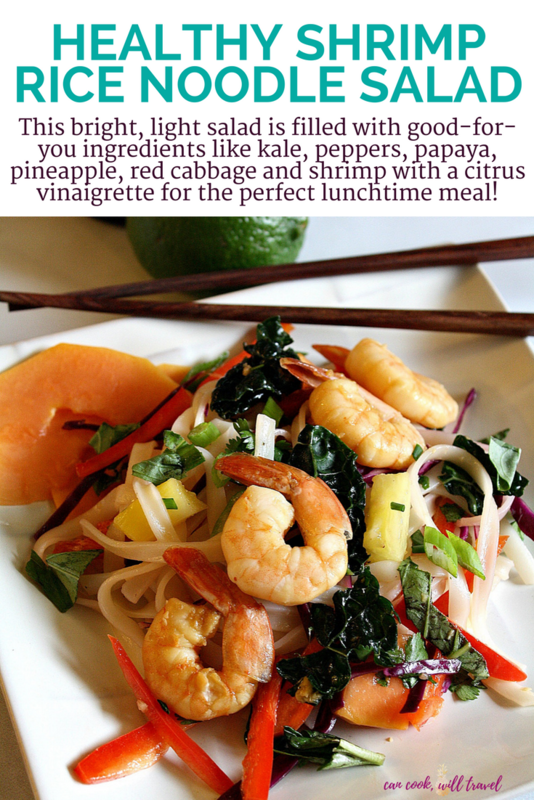 The dressing really rounds out the Rice Noodle Shrimp Salad, because the lime makes it light and bright. And I didn’t use it all, because I wanted to have some on hand in case the leftovers could use them. There’s also a lovely touch of heat from the red pepper flakes of the marinade and the fresh herbs’ spice. I noticed that my basil I picked up at the store had a slight pepper-y flavor, which added more dimension. 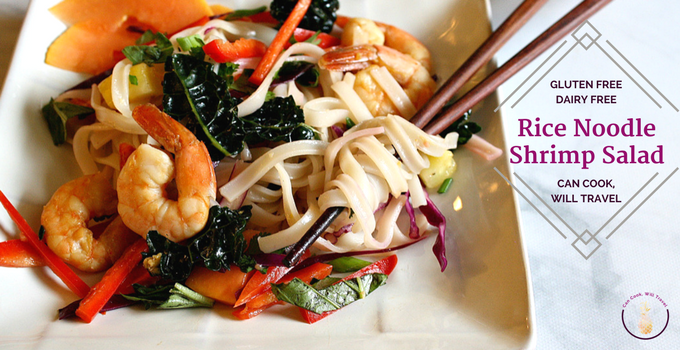 There’s a ton going on in this Rice Noodle Shrimp Salad, but don’t let that scare you off. Every ingredient has a purpose, and you will love how it all comes together. I’m already drooling thinking about my leftovers for tomorrow! 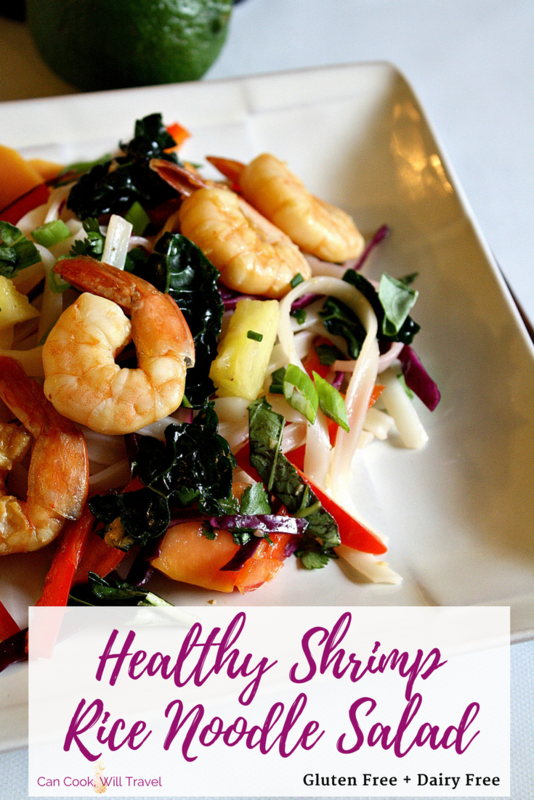 I can’t wait for you to whip up this Rice Noodle Shrimp Salad recipe, so click the link if you want step by step instructions. And happy salad making! Get ready for a healthy and light pasta salad that's also gluten free to have you eating well all week long! Noodles: Begin by soaking the rice noodles in a dish covered in cold water for 30 minutes. Then cook for 1-2 minutes or until it’s your desired consistency. Immediately drain and then rinse with cold water. Shrimp: While the noodles soak, whisk together the marinade ingredients, and then toss the shrimp in the marinade. Let the shrimp sit for at least 15 minutes. Then heat a large skillet over medium heat with a little olive oil. Add the shrimp and cook for 3 minutes, then flip and cook another 2-3 minutes. Salad Dressing: Whisk all of the ingredients together and set aside. Finish: In a large bowl massage the kale and cabbage with a little salad dressing for about 60 seconds. Then add the noodles and red pepper and toss. Finally add the pineapple, papaya, green onions, cilantro, basil, and 1/2 the dressing to the bowl and toss together. I kept the shrimp separate to add to each individual serving, so take up the salad, top with shrimp and a few more fresh herbs and enjoy! Quick Tip #1: You can make the dressing in advance, so you save some time. Quick Tip #2: For leftovers, keep the shrimp, dressing, and salad separate, because then you can reheat the shrimp separately and have control over how much dressing you have on the salad. Three years ago: Honey Beer Bread is Seriously Tasty! Four years ago: Well Hello Quinoa Stuffed Red Peppers! Seven years ago: Look at Me…I Made Pasta…From Scratch!